Posted on Wednesday, August 17th, 2011 at 3:38 am. Team Obama is going to have a difficult time nitpicking Rick Perry’s jobs record in Texas, according to Political Math. During [the recession], 739,000 people fled into Texas. Anyone who takes that data and pretends that this is somehow bad news for Texas is simply not being honest. At the worst, I’d call it a good problem to have. So, to give something of a better feeling for the economic situation across states, this chart takes the population of the states I selected above and judges the current job situation against the population as it stood at the beginning of the recession. Using that metric, Texas would have a very low unemployment rate of 2.3%. But the fact that unemployment in the United States is fluid means that the unemployed flock to a place where there are jobs, which inflates its unemployment rate (at least in the short term). 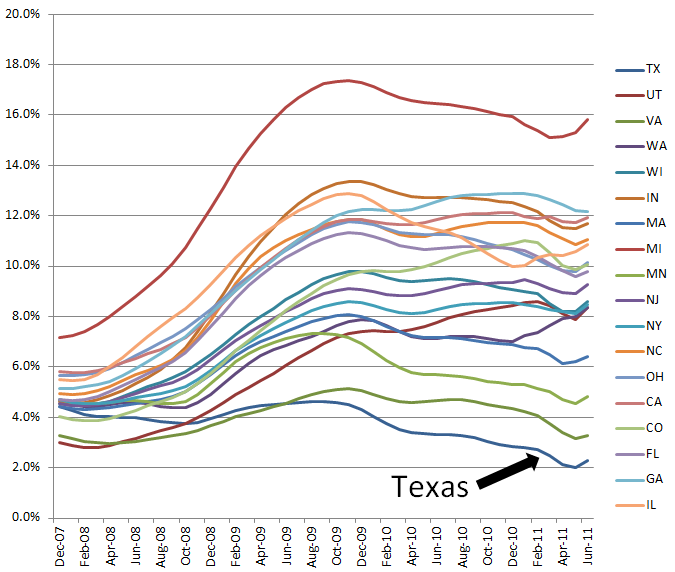 It’s not a bad thing for Texas… it just looks bad when dealing with the isolated “unemployment %” statistic. My advice to anti-Perry advocates is this: Give up talking about Texas jobs. Texas is an incredible outlier among the states when it comes to jobs. Not only are they creating them, they’re creating ones with higher wages. One can argue that Perry had very little to do with the job situation in Texas, but such a person should be probably prepare themselves for the consequences of that line of reasoning. If Rick Perry had nothing to do with creating jobs in Texas, than why does Obama have something to do with creating jobs anywhere? And why would someone advocate any sort of “job creating” policies if policies don’t seem to matter when it comes to the decade long governor of Texas? In short, it seems to me that this line of reasoning, in addition to sounding desperate and partisan, hogties its adherents into a position where they are simultaneously saying that government doesn’t create jobs while arguing for a set of policies where government will create jobs.